The beautiful island of Andros, located on the northern part of the Cyclades, is a very popular holiday destination, due to its wonderful landscape, amazing beaches, traditional villages with welcoming accommodation, and close proximity to Athens. 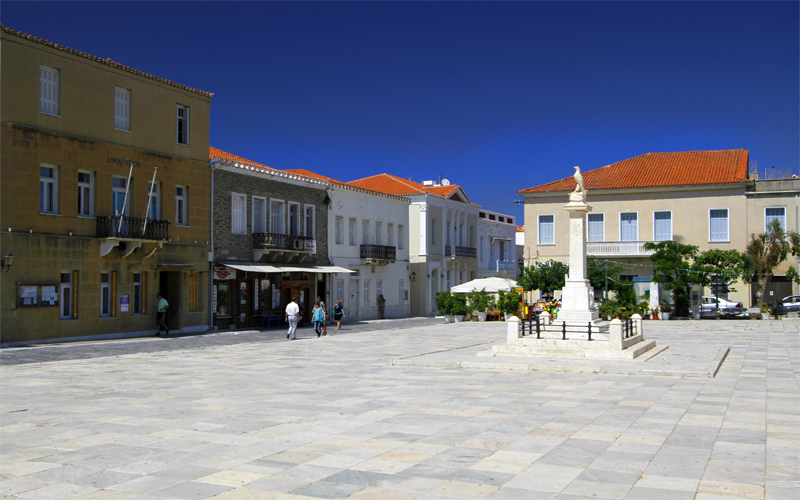 The rich and long history of the island is evident in the several remains found in the villages, including towers, churches and elegant mansions. 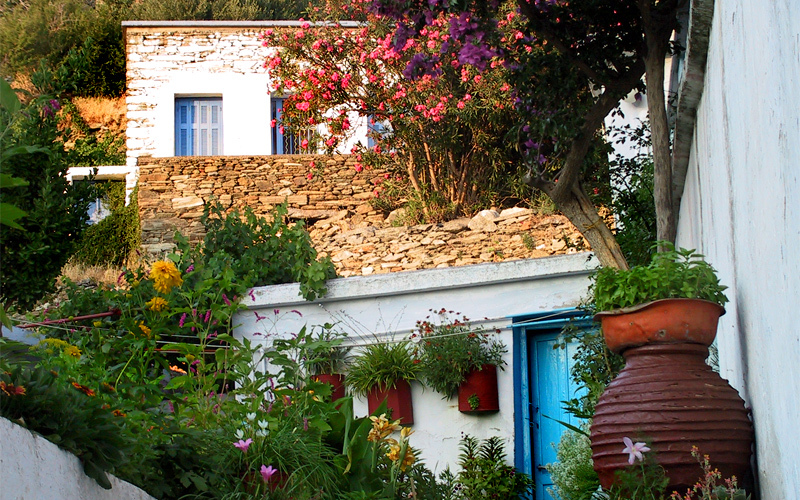 Among the best villages in Andros are the main village of Chora, the tourist resort Batsi, the scenic Menites and the ancient Paleopolis. Chora, the capital of Andros , is a lovely town located on a peninsula at the eastern part of the island, between the sandy beaches of Neiborio and Paraporti. In Chora visitors will explore historical buildings of Venetian, Byzantine and Ottoman architecture, mixed with colourful Cycladic houses and elegant Neoclassical mansions. There are a lot of tourist facilities in Chora, found mostly in the main square. The most important landmarks of Chora include the remains of the old Venetian Castle, the medieval structure and its gateway, a marble paved square with the statue of the Unknown Sailor, upper-class houses of ships’ captains and the Monastery of Virgin Mary, along with many other Byzantine churches. The most tourist developed resort of the island, Batsi is a cosmopolitan destination, combining natural beauty with modern amenities. Built amidst an all-green setting and surrounded by beautiful beaches, such as Golden Beach and Agios Petros, Batsi offers an excellent example of Cycladic architecture with little red-tiled coloured houses circling up the port. In Batsi visit the famous monastery of Zoodochos Pigi, which houses many rare exhibits. 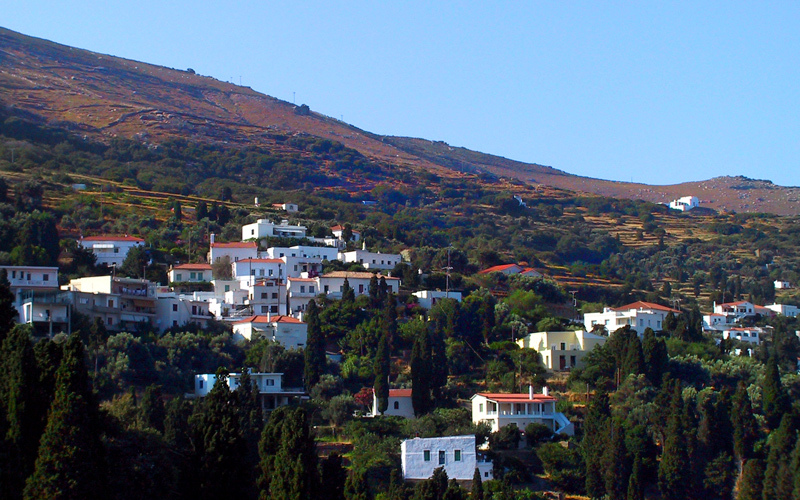 Menites is one of the best villages of Andros, built on the verdant slopes of Petalo Mountain, at 200 meters above the sea. It is very close to the picturesque settlement of Mesaria and about 6km from the capital, and is particularly famous for its magnificent scenery. Clear springs and greenery surround the mountainous village, creating the perfect environment for trekking and hiking. The highlight of Menites village are the Springs of Dionysus, fountains with the form of lion heads in the village’s main plateau, where celebrated feasts of Dionysus used to take place. Found at the western coast of Andros, just 9km from Batsi, Paleopolis is a scenic green village, which was the ancient capital of the island. Paleopolis was a flourishing centre during the Classical and Roman times. Visitors can access the ruins of the ancient city by following a narrow path with steps down to the beach or driving to the site. Today it is a modern village, among the best villages in Andros, with a tavern and cafeterias, boasting a stunning beach, impressive Byzantine churches, and a historical museum. © 2019 Villa Maniati Studios in Andros Island Blog. All Rights Reserved.